After Oppo Find Now Vivo has launched Vivo NEX smartphone in India. It comes with Pop up Camera and In Display Fingerprint Scanner. It has a 6.59-inch Full HD+ Super AMOLED screen with ultra narrow bezels with 91.24 screen-to-body ratio, Screen SoundCasting Technology, and 8-megapixel pop-up front camera that automatically rises and hides when you open and close the camera app. This uses extremely precise micro-stepping motors, with independent drive ICs and precision control algorithms to precisely control this process, says Vivo. Vivo Nex is powered by 2.8GHz Octa-Core Snapdragon 845 64-bit 10nm processor with 8GB RAM, and 128GB storage. On Camera has a 12-megapixel rear camera with Sony IMX363 sensor, 4-axis OIS, along with 5-megapixel secondary rear camera for AI portrait shots with auto scene detection. It has an in-display fingerprint sensor, and the company says that the third-generation screen fingerprint technology, is smaller, and more powerful offering 50% better accuracy and the unlocking speed is increased by 10% compared to the predecessor. The phone runs on Android 8.1 (Oreo) with Jovi AI. 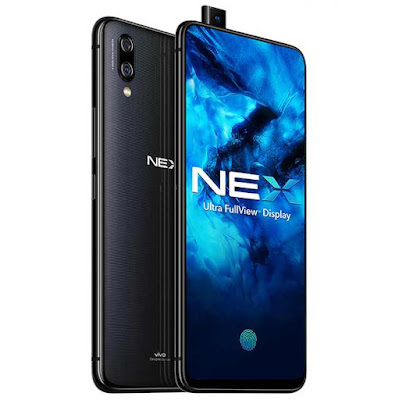 The phone comes in Star Diamond Black color that uses holographic technology and a metal frame.Connectivity options include Dual 4G VoLTE, Wi-Fi 802.11 ac (2.4GHz / 5GHz) 2×2 MIMO , Bluetooth 5 LE, GPS + GLONASS, USB Type-C.
Vivo NEX comes in Black color in India, is priced at Rs. 44,990, and will be available for Pre-order from today exclusively on Amazon.in as well as Vivo Shop online and ships starting from July 21st.